Take time to bring yourself into the present moment on the morning of your wedding. Transform your day from a to-do list blur to an embodiment of your values and intentions. Be the light for your fiancé, family and YOURSELF during this exciting yet emotional time. important days of your life. imber provides all yoga mats, cork blocks and straps needed for the session. The bride has a white mat, strap and rose towel for her practice. The groom has a black mat, towel and strap for his session. Savanna is closed with vibrations from the heart chakra singing bowl. 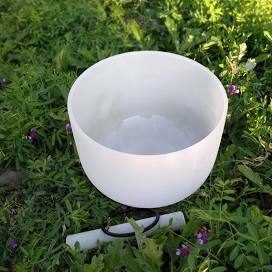 The vibrational frequency of this bowl is tuned to flow through the heart chakra, which is said to allow energy into your heart center, encouraging this pathway to open, energize and heal. Each session starts with bringing focus on the breath. This is followed by a guided intention setting session to bring to mind the reason for this special day. Practice ends with savanna, giving the bride and groom a foundation of presence and breath to take into their day. without seeing each other the morning of the wedding.